Popular due to its compact size and adequate power, the .380 ACP was the primary pistol cartridge in the early 1900s for several prominent countries, including Fiocchi's Italy. Most Europeans would know it by another name; 9mm Short. It was replaced for military use after World War II mostly by the 9mm Parabellum. Still, .380 ACP is one of the best calibers for concealed-carry, and it's a whole lot of fun to practice with at the range. Most .380 pistols have very light recoil, which makes reestablishing the sight picture quicker and easier for follow-up shots. Fiocchi Ammunition is made with high quality materials in Lecco, Italy and Ozark, Missouri. 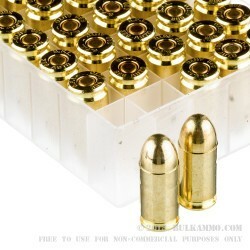 This ammunition is new brass-cased, boxer-primed and loaded with 95 grain full metal jacket projectiles. American Ralph Waldo Emerson's poem "Concord Hymn" is the origin of the phrase "shot heard around the world", where he described the battle of Lexington & Concord that marked the beginning of the American Revolutionary War. The phrase is also used as a reference to the assassination of Archduke Franz Ferdinand of Austria in Sarajevo, Bosnia. The caliber used in this cataclysmic event: the .380 ACP. A: Hello! 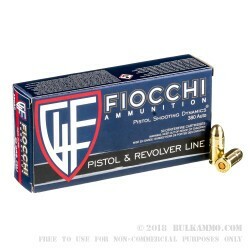 This Fiocchi ammunition is loaded with all new components. It does not contain any corrosive components at all. 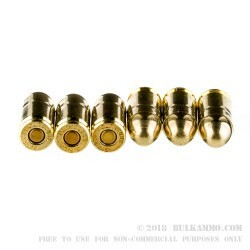 Q: The product overview does not say what the casings are made of...are these brass? 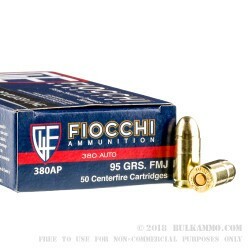 A: Hello Tim, This Fiocchi ammunition is loaded with boxer primed brass cases. Q: Can I purchase Hollow point in this ammo for 380 price 1,000 rounds? A: The hollow point ammo (indicated by JHP) costs more to make as the bullets have a complex design compared to the full metal jacket ammo. To view our 1,000 round lot selection, you will be able to sort our products by different attributes as seen on the left side of your screen. Since JHP ammo usually costs more, this selection may be limited for 1,000 round units. Quantity discounts are included for purchasing multiple boxes. Purchasing 5, 10, or more boxes of 20 or 50 rounds will lower the price seen. More details on this may be found on the detailed view of the item you are interested in.